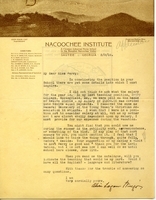 Alice Wingo wishes to inquire more about the Berry School, especially about her possible position and salary. 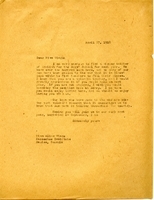 She includes a list of acquaintances and former students who Martha Berry could contact as references. Martha Berry is glad that Wingo will consider coming to teach at Berry. The school can offer her sixty dollars a month for salary with room and board and it would be possible for her mother to come and stay with her. 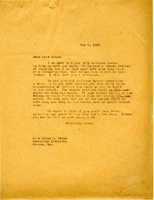 Berry writes to Alice Wingo in hopes that she might come to the Berry School to teach English during the next school year. Since many of the male teachers have gone to war, the school is short for the new year. 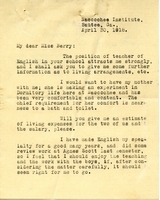 Wingo is interested in the teaching position the Berry School, but she asks Martha Berry for further information, including if she may bring her mother with her.